He wants to bring "committed people who will be changing Ukraine". Prime Minister Volodymyr Groysman announced his participation in the next parliamentary elections to be held in the autumn of 2019. "I want to fight for Ukraine and will take part in the next parliamentary elections, and I want to bring committed people who will be changing Ukraine with specific decisions and steps," the prime minister said on Twitter. He noted that there was no reason to call an early election this year. "Currently, there are no grounds for holding early elections. We can take many decisions useful for the country in this year and a half. 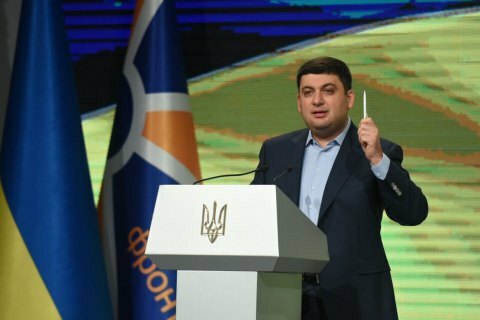 If our law on tougher punishment for bribery of voters gets passed, we will have a chance to see a new quality of the elected [MPs]," Groysman said. As reported earlier, Groysman is the leader of the Vinnytsya European Strategy party. The former mayor of Vinnytsya joined big politics in 2014 as deputy prime minister in the government of Arseniy Yatsenyuk. In the autumn of the same year, Groysman was elected to parliament on the list of the Petro Poroshenko Bloc and became parliament speaker. Since April 2016, he has headed the Ukrainian government and built rapport with Yatsenyuk's People's Front party.